Next to the existence of the canal itself, the most important question was on what route through the city of Pittsburg should the canal be run. One plan was to extend it down Liberty and Penn streets, another down Smithfield, and another in a tunnel through Grant's Hill, the objective point being the mouth of Suke's Run. The tunnel route was finally selected, and the contract for its construction was given out. "Be it resolved by the Select and Common Councils, That the Board of Canal Commissioners be respectfully but earnestly requested to adopt the latter route (tunnel line ending at the mouth of Suke's Run), and in that event the faith and funds of the city be pledged; that the expense of making the canal, tunnel and bridges according to the report of the engineer, including damages to private property, as well as all other attendant expenses, shall not exceed the sum estimated by the engineer as the costs of the Liberty and Penn street route, with the addition of $10,000 of damages to private property, allowed by the board in their resolution of February last" (City Ordinance of May, 1827). Early in 1827 the question of the western termination of the canal was seriously discussed by the citizens of Pittsburg and Allegheny, the latter insisting that to extend it through the former to Monongahela was an unnecessary and useless expense. But Pittsburg had in view a closer relation with the canal than across the Allegheny, and also had in view the extension here of the Chesapeake and Ohio Canal, and designed a union of the two at the mouth of Suke's Run at some future time. Time proved that the building of the tunnel was a useless proceeding, wholly unnecessary and followed by no suitable recompense. On May 25, 1827, Acting Commissioner A. Lacock called for proposals to be delivered at the house of George Beale, in Pittsburg, for constructing sections of the canal of about a quarter of a mile each from the mouth of Pine Creek, for the aqueduct of 1,100 feet, and for the tunnel. In May, 1827, the canal commissioners adopted a resolution for continuing the canal down the west side of the Allegheny River to a point opposite Washington Street, there to cross and proceed by a tunnel through Grant's Hill to the Monongahela at the mouth of Suke's Run, the work to commence immediately. The laying of the foundation stone of Washington Lock No. 1, Pennsylvania Canal, May 3, 1828, was attended with great ceremony. It was the western termination of the canal. In March, 1829, the contractor to build the canal tunnel under Grant's Hill having failed to complete the work, proposals were called for from contractors to finish that task. "Boats have passed the subterranean passage through Grant's Hill and safely debouched into the Monongahela River. The canal is also generally navigable and an inland trade is brisk. Some skeptical gentlemen have affected not to understand this underground project, but they may now not only see through it, but go through it in a canal-boat" (Statesman, August, 1832). During the latter part of June, 1827, the western division of the canal was under contract. 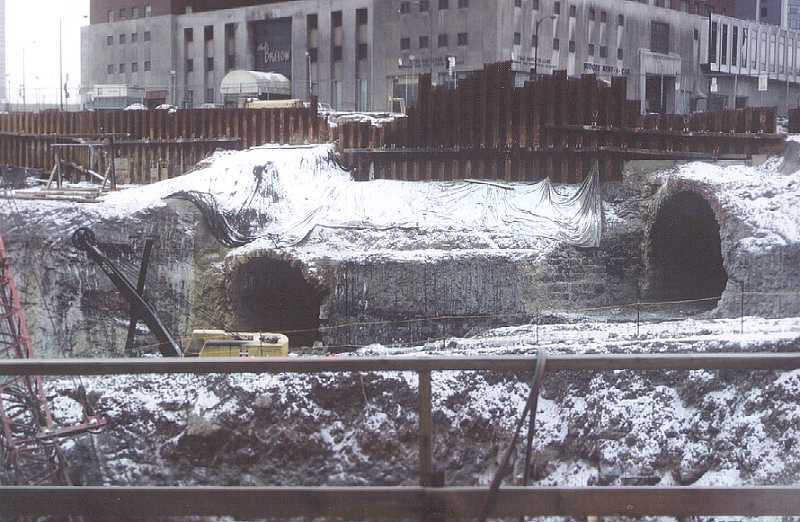 The construction of the Allegheny river aqueduct was undertaken by La Barron for the sum of $100,000, but on his failure to complete the work, it was finished by another contractor. The tunnel through Grant's Hill to the Monongahela river was let to Meloy & Company at $61,000. It was stipulated that both tunnel and aqueduct should be completed March 1, 1829. A canal may be briefly described as an artificial water way over which boats were drawn by mules. By the side of the canal was a narrow path, called a tow-path, on which the mules were driven. They were hitched, tandem, to a long rope which was fastened to the front part of the boat. By means of the rudder, the boat was kept in the middle of the canal and could readily be landed at the side opposite the tow-path when necessary. Each section of the canal was a level from one end to the other. The next section of the canal being lower or higher than the first, the boat was either lowered or raised as might be necessary, by means of a lock, which was practically the same in construction as the locks now used on rivers which are made navigable by slack water dams. Those on the Monongahela near Pittsburg illustrate well the principle, but are much more complete than those in the early days of canal building with their limited capital would warrant. The average canal was about 30 feet wide and held from four to five feet of water. 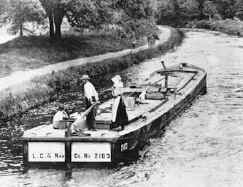 The canal boats varied in length and width. They were generally about 12 feet wide and from 25 to 50 feet long. Two boats could therefore pass each other, for a boat was never quite half as wide as the canals. These canals sometimes passed through hills by tunnels and likewise over small valleys or rivers by embankments or bridges, the latter being called aqueducts. The canal was fed at its highest section, usually by a dam across a stream or river, and the water then moved slowly from there to the next section lower, and so on to the end of the canal. These basins being almost level, the water went so slowly that it often became stagnant in the summer, and there being almost no current at all, the boat could be landed at any time, and the draft was about the same going either way. It was indeed a very cheap system of transportation, and was well suited to that age of limited finances. Two mules could easily draw a canal boat laden with from 50 to 100 tons, and the average speed was about three miles per hour. The mules were driven on a rapid walk or slow trot, unless the boat was unusually heavily laden. While this speed was sufficient for iron, coal, lumber, stone or almost any species of freight, it was too slow for passenger traffic, and the canals were never, therefore, very much opposition to stage lines passing over the turnpike between Pittsburg and Philadelphia. They were; however, of great advantage in the transportation of freight and reduced the wagon trade correspondingly on the pike.